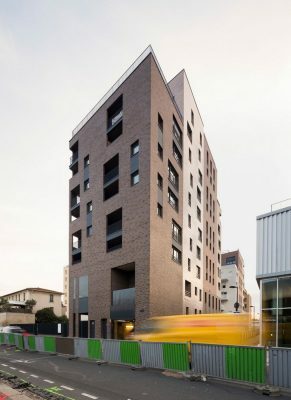 Located on a plot of land in Ivry-sur-Seine and close to the river, this 104-unit project had to adapt to the physical constraints of its environment while enhancing the brief with added value. 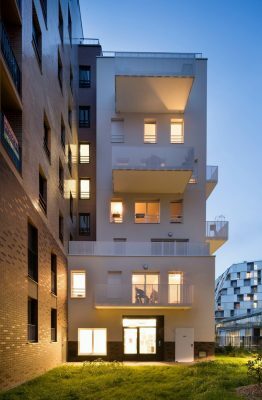 Composed of three apartment buildings, two of which are for private ownership and the third for social housing, the buildings stand in a verdant environment with a landscaped inner garden, visual openings onto the Seine and roof terraces enhanced by flower- and kitchen-gardens open to everyone. Arranged in a staggered design, the three buildings are broken down into varying volumes, materials and tones so as to create variations of scale and embellish them with slimmer lines. A dense, urban project that the agency has transformed with panache into a habitat favourable to encounters and conviviality in a bucolic setting. 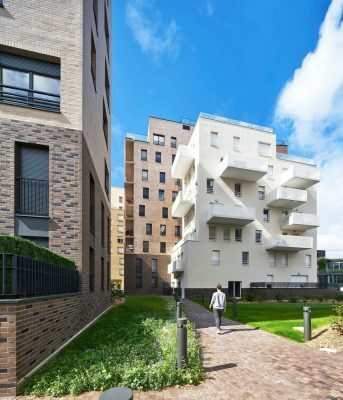 The project is located in the Ivry Confluence development zone at 74–76 Avenue Jean-Jaurès. 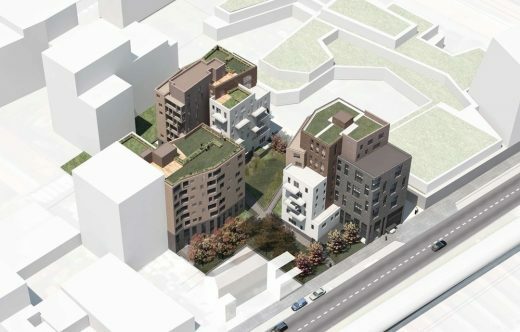 It contains 104 housing units: 64 for ownership and 40 for social rentals. There are three buildings with a shared underground parking garage between them. 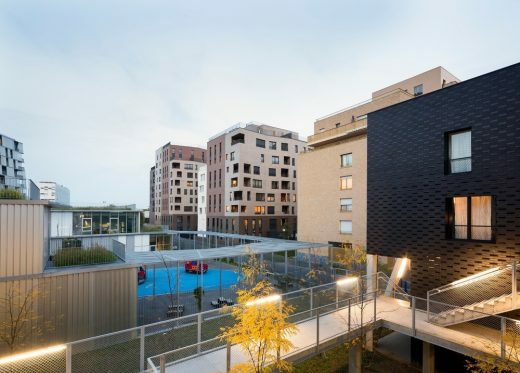 The three buildings are staggered to reduce the feeling of mass, create visual openings towards the centre of the project and take advantage of the views of the Seine. 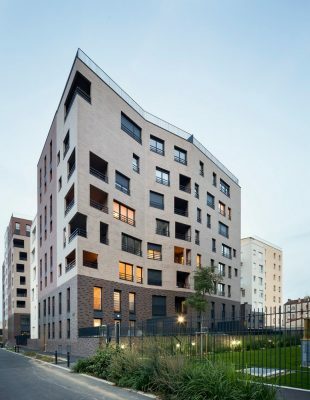 Located at the heart of a densely populated neighbourhood, the project’s design maximised landscaping and opens towards the outdoors and distances. Two of the buildings are lined up along the alley while the third is a pinion on the neighbouring plot. 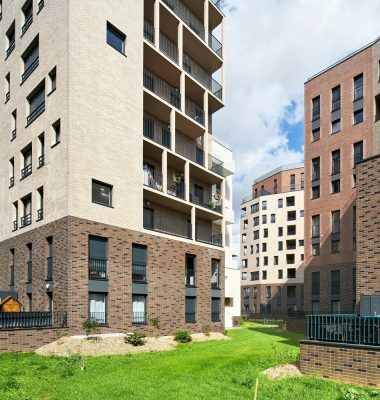 The middle of the project is generously landscaped to give the buildings a verdant setting. 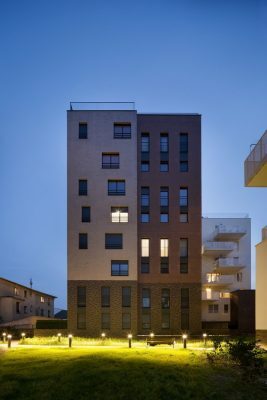 The three buildings are broken down into varying volumes, materials and colour tones to create variations of scale and give them more slender proportions. Volume fragmentation and variations in heights help reduce the perceived density. Cladding the facades in terracotta, the shades of which range from brown to beige, contrasts with the volumes in white. This play of materials reinforces the breakdown while the ensemble of colours forms an elegant layering effect that gives rhythm to the facades. The plots are unified by identical bases in treatment and appearance. 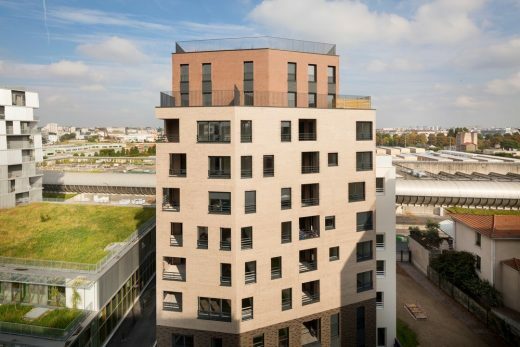 The base is split level because the land is located near the Seine, thus on a flood plain. The access paths reproduce this same terracotta theme on the ground so as to create continuity with the facades. The large windows in the bases are twinned on two levels, thereby evoking large urban windows. 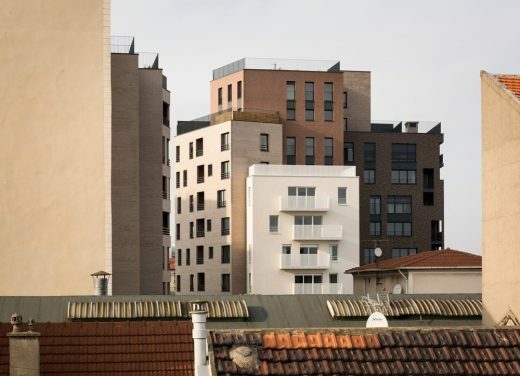 The buildings are clad in natural terracotta by the Rairies Montrieux company, varying tones from brown to beige, from matt to glossy. The dark, matt brown “Montnoir” and “Liquorice” colours contrast with the variable shades of “Havana” brown and enamelled and clear “Silver” glossy beige, setting off the volumes from each other to compose the image of the buildings’ unity. This shading confers an identity to each of the plots. The small variations between the bricks of the same tone, a specificity of terracotta, also makes it possible to highlight the material. The use of bricks in window apexes, turned vertically as lintels of the large windows and loggias, gives the illusion that the building is built entirely of bricks. A play of dark brick jointing strengthens the design of the bases. 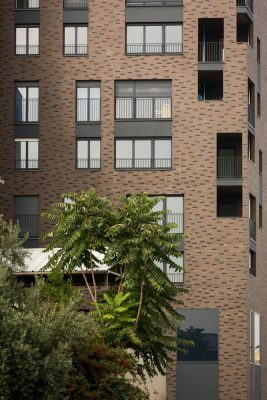 “Montnoir” bricks account for 20% of the surface and fit randomly between “Liquorice” bricks and enliven the façade. The pointing between the bricks is treated in charcoal grey. These details and colours are again seen in the treatment of the entry halls and garden walls and even in the pedestrian paths in the centre of the plot. They are composed of “Liquorice” colour paving stones also from Rairies Montrieux. The juxtaposition of these elements contributes to creating an elegant, harmonious whole. The garden and the bases of the buildings are generously landscaped with plants and trees. 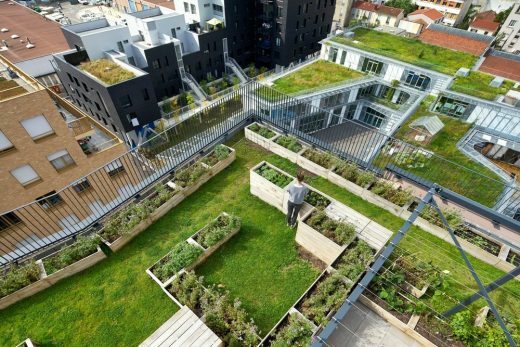 A lawn-covered garden on Avenue Jean-Jaurès and the alley is the main constituent of the alignment, making it possible the gauge the depth of the verdant central area from the alley and the avenue and merge the buildings into a greener environment. These green spaces are continuous and partly composed of lawns and prairie-like fields, planted with varied clusters of blackthorn shrubs, cornelian cherry, walnut trees, bladder nut, buddleia, hornbeam, lilies, privet hedges and high branch trees such as pear and elm. The ground- and slab-planted parts contain low-lying and climbing plants. The pedestrian paths of terracotta run through the garden, inducing gentle strolls past the feet of the buildings. 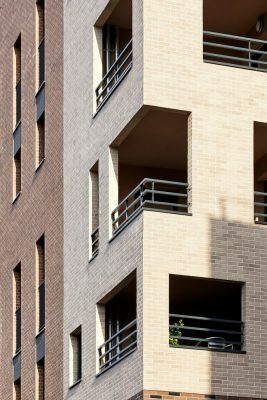 The way in which the facades and volumes are arranged makes it possible to offer private gardens to all units on the ground floor split-level and balconies, large terraces and loggias on the upper floors, giving onto the living room and kitchen, up to the roof itself which is shared by all residents. The balconies and loggias enable genuine freedom on the architectural level and provide flexibility in the openings and overhangs. The facades thus become a subtle, sculptural play of fullness and emptiness, light and shadow. 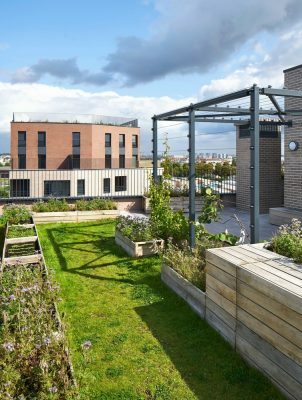 The accessible roofs of the two buildings devoted to ownership contain urban kitchen-gardens, flower gardens and pergolas for residents. 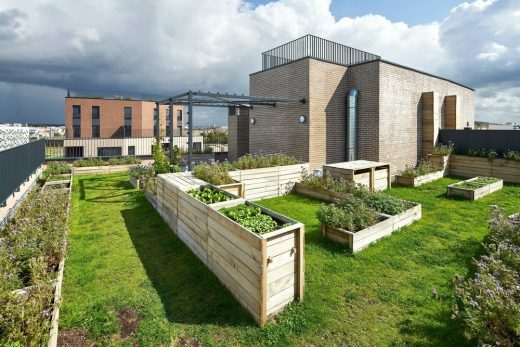 Kitchen-garden tubs are placed in these gardens, offering residents a way to take advantage of the pleasures of gardening and raise their own vegetables through urban ecological farming offered to them just overhead from where they live. A worm-composting system has also been implemented on the roofs for organic farming and the creation of a new ecosystem. These places are also conducive to encounters and conviviality between residents while introducing a range of possible uses other than gardening. A large experimental green roof has been installed on top of building C for social housing. Composed of an unplanted sub-layer, the idea of this roof is that of natural fertilisation and landscaping by way of bird-nesting boxes, thereby encouraging the influx of seeds and organic fertilisers. People are greeted in the buildings by spacious, bright entrance halls. A genuine window onto the garden, they bathe in natural light through large picture windows, enhanced by the play of reflections and depth given by large mirrors on the walls. These entrances lead to all annex services (storage rooms for strollers, bicycles and rubbish bins, etc. ), the underground car garage and the upstairs flats. Hallways enjoy natural light with the constant goal of not only comfort but also energy savings. 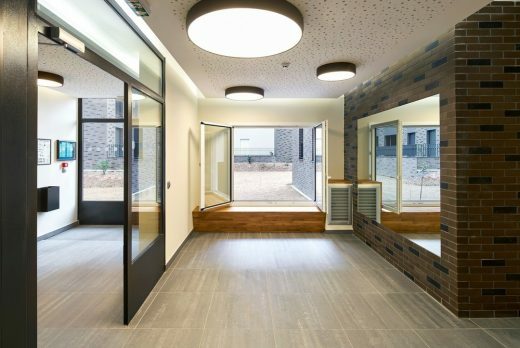 Both hallways and entrance halls benefit from acoustic ceilings so as to ensure peace and privacy in the flats. Both rental and ownership units are big, enjoying double, even triple exposure. It is important for each unit to use several orientations to encourage natural lighting and freshen the air through natural ventilation. 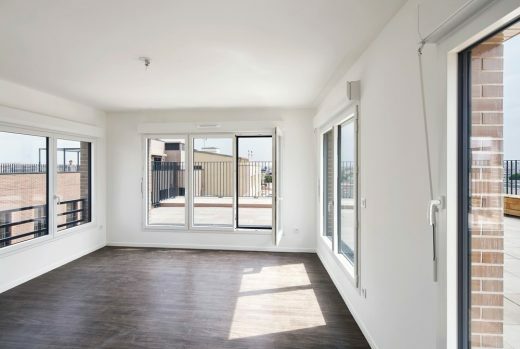 Each flat possesses large outdoor spaces leading to both the living room and kitchen. The flats are configured in such a way as to take advantage of natural light in every kitchen and sometimes even in bathrooms. More often than not living rooms are placed in corners with double exposure to take advantage of a maximum amount of sunshine. Large picture windows let in the sunlight and provide views onto the gardens and the Seine to the east. The higher up flats are designed on two levels. With a view to comfort and openness, these split-level flats perch on the roofs like small houses. They provide occupants with bright, triple exposure living space opening onto very large private terraces with uninterrupted views into the distance. 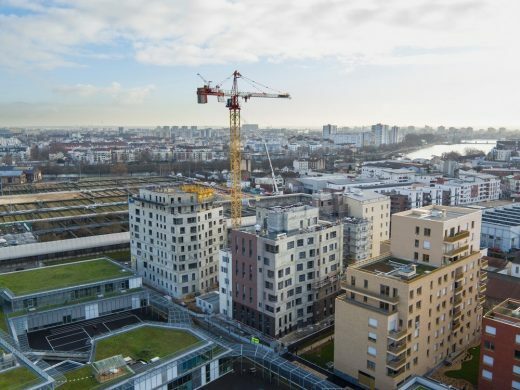 The land on which the 104 units are built can flood when the nearby Seine reaches exceptional levels. 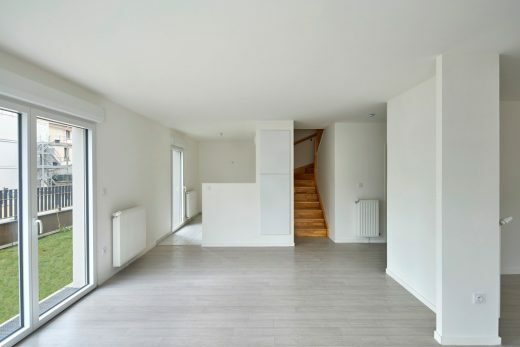 In order to counter the risks of flooding, the ground-floor flats have been designed as split-level so that, in the event of the highest possible flood waters (highest known levels, over 30% with a minimum of 20 sq. m), at least part of the dwelling remains inhabitable. A device has also been designed so that lifts cannot descend below this level in case of a millennial flood. Using this particular situation, each ground-level split-level opens onto a private garden that is accessible from the living room. The buildings stand over an underground garage that is floodable. This specific was a challenge for the building site where the nearness of the water table had to be controlled when the ground was first excavated. A water-table drawdown with filtering points was installed to make the reservoir for retaining rainwater, the floor of which is extra deep in relation to the infrastructure level of the garage and has been designed to resist hydrostatic pressure.